It’s not all fun and frolic—and chocolate—around here. Aside from dealing with banks that limit access to your own money, or scratching your head when the France Telecom representative tells you that it’s going to cost you a mere €465 to keep your mobile number if you change to another one of their other phone plans (although it was a stretch to even get there; his first response was, “Yes. It is not possible”), believe it or not, there are some less-than-pastoral things about life here. Sure, various black truffles are found in Spain, Italy, China, Croatia, and even in the United States of America. But none that I’ve smelled compare to the famed black truffles unearthed from woods and forests of southwest France. Rien du tout. 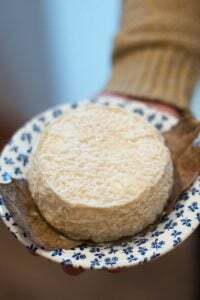 When I worked in the restaurant business, we’d often get knobbly black truffles sent to us, which were shaved over simple dishes like pasta, potatoes, and risottos; anything more complicated competes with their funky, pungent, but highly-prized aroma. People go ga-ga over truffles, but I never caught the truffle bug, which was excellent news for my wallet. 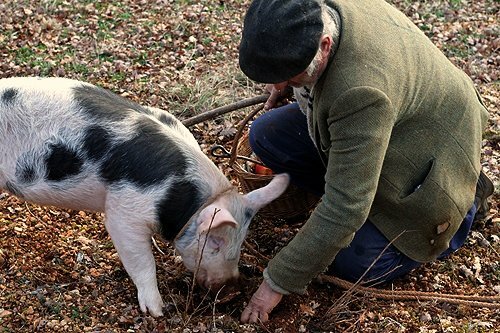 On my recent trip to Cahors, we went for a walk in the forest with a truffle hunter—and his boisterous pig, in search of black truffles. And it was there I learned how they work together to find these elusive tubers. 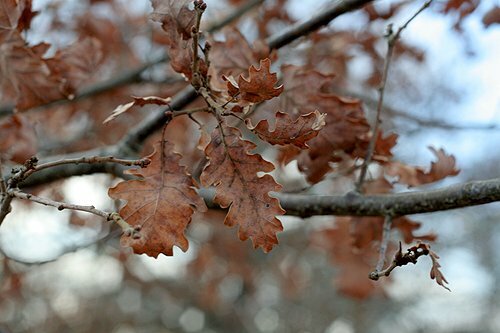 It was a very chilly winter day, so cold that even the leaves on the spindly oak trees were shivering. But that’s truffle season; January and February. And if you want to find truffles, they’re not going to land in your lap while sitting at home by the fireplace. One needs to roam through the forests, where the trees have been stripped nearly bare by the icy winds. And even though seasoned truffle hunters don’t require much protection, un certain Parisien was bundled up quite well for the search. Because black truffles grow a few inches underground, unlike us, they’re impervious to frost. But that also makes them hard to detect. 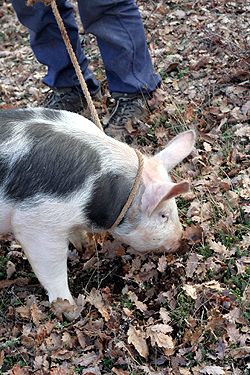 So truffle hunters use either dogs or pigs to find the elusive spores. 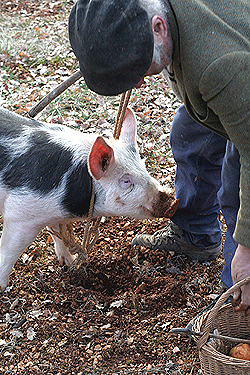 In the past, pigs were used almost exclusively to rout out the truffles. But in spite of how cute and picturesque the furry fellows are, for the most part, dogs have taken the place of the porkers. When a single truffle can set you back well over a few hundred bucks, even the most die-hard animal lover will agree that as much as we love our pets, very few people love them that much. As in, enough to sacrifice a few truffles for. While adorable, pigs have a habit of eating the truffle once they unearth it. Hence the stick, which I didn’t see being used. And this particular hunter carried a running monologue with the pig as it scampered around, obviously thrilled to have a captive audience to his ramblings. The only mistreatment of the animal I saw was that he likely wouldn’t get a cut of the take once the truffles were sold. Still, in spite of the cold, I can think of a lot worse things than roaming around the forest, sniffing truffles. 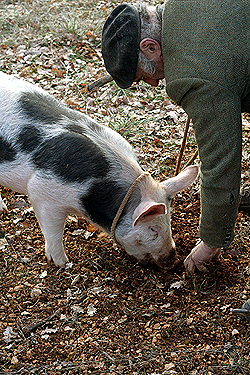 There was an obvious bond between the two, and the truffle hunter immediately sensed the moment the pig had found something because as soon as the pig buried its gueule in the rocky earth, he’d wait just a nanosecond before quickly swooping down and plucking the truffle from the hole before the pig could swallow it. The motion was so fast, that if you blinked, you’d have missed it. But lest you think the pig was being cheated in any way, as soon as the truffle hunter pulled the truffle a safe distance from the twitching snout, the pig made a mad grab for the basket, where an assortment of potatoes and apples were doled out as rewards. I doubt the pig was thinking how undervalued its labor was, and it seemed to be quite content. And once happily fed, le cochon scampered away, in search of the next truffle. Unfortunately for me, the more truffles I sniffed, the more I became intoxicated by their musky scent, and started craving them myself. And while I wasn’t ready to scamper around the forest with my snout in the dirt on the end of a rope (those days are long behind me), after foraging, we were ready to hop over to the market in Lalbenque, to the world-famous Marché aux truffes, which began promptly at 2pm. My French Bulldog Pipi (a dog that looks like a pig) is a “truffler” as I call her. She walks around sniffing and pulls mushrooms from beneath the ground (and has gotten quite sick by doing so). I keep thinking that if I could get her to France for truffle season we’d hit the jackpot…. beautiful photos, by the way (especially that first one. It’s timeless). First time for me, truffles shaved over a salad at the ‘old/original’ Jamin (pre Robuchon). Fabulous! Though what stayed in my mind for all these years as well— was that the salad alone cost more than dinner for two at a nice restaurant in Milan the following weekend! Michel Lorain (Le Cote St.Jacques in Joigny) was known for his WHOLE truffle encased in what looked like a tiny cabbage. 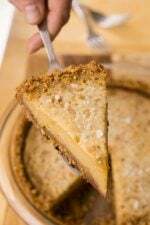 The aroma of steaming delectableness (word may not be in the dictionary!) when the silver dome was lifted, heaven! Your photographs for the article are great! Fabulous post. I can’t wait to read the rest. It’s so interesting to find pieces of gastronomy not tainted. It doesn’t get more raw than forraging in the forest for truffles. So France Telecom is no different than any other telecom–charges big bucks for a contract change–what else is new? But back to the heavenly truffles—aside from following the farmer and his snout sniffing hog, did you even have a chance to at least hold one of the heavenly delights yourself? They may taste and smell out of this world, but they sure aren’t appealing in looks. But their elusive availability makes them ever so desirable. Hope that you got at least one of your own to keep. 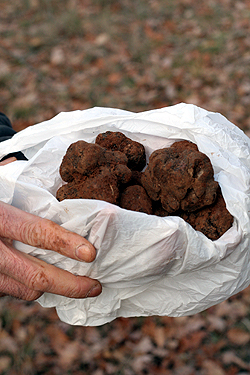 Maybe the best Truffle hunting images I have seen. That pair shows they are content with what they do. How perfectly rustic! Beautiful photos that show all the charm in both the animal and it’s master. I love it. I’ve collected mushrooms en the woods as a child and I think that the experience is more rewarding than the prize itself. David, I’d like to take advantage of this post and ask you a question about coffee. Have you ever tasted a cup of coffee made by a Nestle Senseo machine? If so, did you like it? Great photos, David, so authentic! C’est la France profonde que j’adore !!!! Without questioning your talent as “pâtissier”, you are incredibly gifted for writing !!!! Sometimes, you make me laugh with your American point of view about France….if one day, you want to give up pastry, please don’t give up writing !!!! Fabulous post David. The pictures are exquisite and as usual, your informative writing peppered with humor is a delight. Thank you for sharing this day with your readers! Wonderful photographs, especially that first one. Makes me very nostalgic for my year spent in Southwest France. Truly spectacular photos. And damn that pig is cute. Oh, what I wouldn’t give to be impervious to frost!! 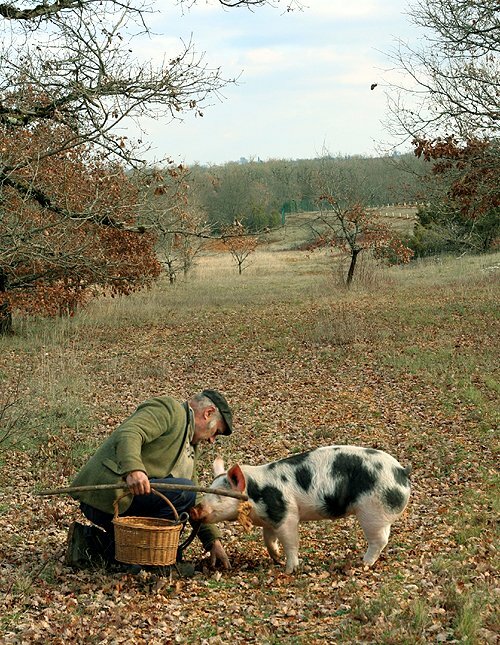 I love your photos of this truffle hunt-sw France is so incredibly beautiful! I have yet to have the opportunity to savor the deliciousness of truffles. So interesting! What a cool experience for you. I can’t wait to hear about the market as well. I have had far too little truffle eating experience in my life, so I’ll live vicariously through you for now! I enjoyed this blog entry a lot…just hung on every word. So..does the man own the land he’s hunting truffles on? Does he pay to hunt truffles on someone else’s land? Is it public land? How does this work? What beautiful pictures. I love photos that tell a story, as yours do. I have really enjoyed reading your blog, David. Thank you. I loved your story about hunting for truffles. I love to go wild mushroom hunting. One of my greatest days was finding a patch of chanterelles. I couldn’t even imagine how fun it would be to go hunting for truffles. It is good to hear that the pig gets something out of the hunting, I personally think that the apples make a poor substitute for the truffle. It must have been thrilling to be surrounded by the truffles with the possibilities of how to cook them running through your head. *Sigh* How beautiful…. If I could only click my heels and be there in an instant. Wonderful posting, thank you so much for sharing. Those photos are absolutely gorgeous. Great post! OK, that is the cutest freaking thing ever. Absolutely perfect photos. Thanks for freezing your derriere off in the woods so we could all enjoy this story! Like everyone else, I was seduced by the gorgeous pastoral photos. The second one says so much of the man’s love of the earth. 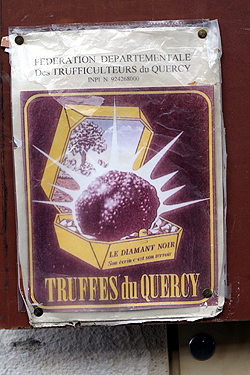 French truffles do have cousins in Oregon and I should have a similar experience. Thank you for this post. noëlle: lol! If I did have that money to spare, I wouldn’t give it to France Telecom just to change plans. Even the guy at the boutique agreed that it made no sense, especially when I told him I could go to SFR, the other phone operator, just across the street, and switch for €99, which included a brand-new iPhone. I don’t think there is a word in French for “no-brainer”, but that would certainly qualify. Maureen in Austin: I am not sure who owns what. I was with two friends who were doing a short film and I was invited along. It was really interesting, and once their film is up, I’ll link to it or put it on the site. Sandra: I got to hold (and eat) too many truffles, if that’s possible. More will be in the next entries, coming up. Stephanie: I really don’t think the pig preferred one over the other. I think they’re trained to find the truffle, then rewarded with an apple or potato when they do. The apples are much larger and to a pig, I think that might be more appealing! I told him he was now officially très Americain! Thank you, David. I do enjoy our trips out into the countryside. Wonderful post, beautiful pictures. I’m looking forward to the rest of the story! I would love to spend a morning with “the truffle hunter”, what an experience that must have been. Just look at the old guys hands, they show the signs of a lifetime of hard graft! Awesome. I am increadibly jealous of your experiences! *Sigh* I’m due for some major travels! I can just smell the crisp Winter air and the luscious tubers! Can’t wait for la suite! Wonderful pictures. You’re an excellent photographer, David! Were those taken with the new camera? The countryside looks beautiful!! What a fabulous way to spend a day! I especially like the photo of the Hunter’s hand holding the rope! What a story that picture tells! C’est Magnifique! It’s unanimous already, but gorgeous, to-die-for shots and interesting-as-hell commentary. Wowie wow wow! Neither a pig or a truffle is a beautiful thing by my standards but you made both truly gorgeous with these photographs and your writing. The first shot should be on a magazine cover. And actually the story should as well. Awesome story and photos, can’t wait to read the rest. Definitely an old school art finding the truffles with the pig. I envy you getting to walk in the woods, unlike we do this time of year in Northern NY, on snowshoes. C’est bon! I wish you’d teach the sangliers in the field behind our house in the hills to be so gentle about snuffling. They dug up the whole field. My but this is a beautiful reportage. I really loved your story, and the pictures, the pig is so cute!!! thanks! Your photos are fantastic – the dude’s hands! I can almost smell those truffles, how awesome. Beautiful photographs! And wonderful post. I’ve never had access to truffles in a retail sense, and have only had them served once in a restaurant. Rare in our neck of the woods. We tend to rely on truffle oil more. What a fantastic opportunity! Can’t wait to read more. WOW! I was just telling my 5 year-old about pigs and how one of their jobs is to sniff out truffles. You have just created a wonderful pictorial lesson plan for me to use this evening! my favorite part of any of your stories is when you make ever-so-slightly off-color jokes. Richard & Fiona: He had the most amazing hands, but would not hold them still so I could take a picture of them. Once he had them behind his back, I snapped a few shots. You could tell those hands have really been working the soil for a long, long time. His clothes were pretty tattered, too. Funny that someone who is handling the most precious delicacy in the world was such an earthy soul. Debbie: While truffle oil approximates the real thing, almost all of it is synthetic and not made from truffles. (Hocus-Pocus, and a Beaker of Truffles.) There are real ones, so if you’re concerned about that, it’s worth doing a bit of research before plunking down the big bucks. Jen: Actually, I took them with my old camera and my el-cheapo 50mm lens, which I brought along that day because I thought it was going to rain. Can’t wait to get the new one, though! I love the photo with his hands behind his back as others have said. They tell a story of his life I’m sure. Nice photography and a great read. I can’t wait to read the conclusion. Don’t know which I worship more, your culinary skills or sense of humor. Thanks for the wildly entertaining and informative blog. The thrill of the hunt…with a pig! How exciting. 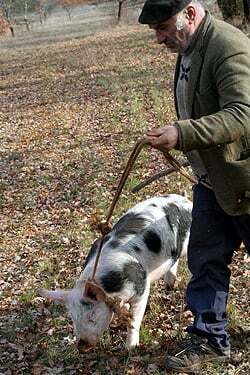 Beautiful pictures and adorable truffle hunter and pig. Can’t wait for what’s next. One of my favorite posts on your blog. Great photos, great writing. David, the French equivalent of “no-brainer” would be “Y’a pas photo”. Meanwhile, as a French person living in the US, that whole “history of credit” and “checking your credit” thing is I believe way more horrible than dealing with French banks. I don’t get the idea of getting into debt at a whopping 29% interest rate in order to establish your credit-worthiness, or how a rating that can so easily be affected by identity theft can bar you from decent housing or from getting jobs. Meanwhile, thanks for this post and for the pictures. That pig looks adorable. That is one cute pig. After reading your well written article, I had to check Google to find out if boars eat truffles. They do! It might explain why they are so rare. Oh thanks, please do. I mainly want to know because I’d like to geaux truffle hunting some day. Surely some enterprising French person offers expeditions…or maybe it’s too sacred. Beautiful pictures; some of us might make do without a phone for this experience! You know what got me? The picture of the truffle farmers hands; so worn, that really touched me for some reason. Well, and his bud…the pig. Thanks for sharing. The first and second to the last photos are particularly terrific. And look at the size of that truffle! Oh to taste that one. I’ve never doled out the cash to buy a truffle, althougth I probably will one of these days. I do love the more affordable way to enjoy the flvaor and scent of white truffles – good quality white truffle butter, while truffle oil, white truffle salt. C’est Magnifique. Been thinking about doing a blog on just that. Thanks for the wonderful blog David. Wish I was there. Would be a great experience! Going truffling is on my list of things to do! If Peter Mayle had had a digital camera…. As long as I’ve been reading your posts and been wowed by some of your photos (enjoying the writing, need I say? ), this post, for me, has the best combination…far beyond anything else. Maybe it’s the implied history that I fear is reaching a close, I don’t know. But it doesn’t matter. The words are pure you, funny, lovely…but I have to say, this time, to me, the words were just a splash of cognac to the visuals…and thus, the bright and brilliant flame! David you might enjoy the book “The Fly-Truffler: A Novel” by Gustaf Sobin (Amazon has it). It’s a sensuous sensitive piece of fiction you’ll never forget about a “truffler” and his evocative dreams. Un must! Absolutely exquisite photos! Wow, just love this post. OK. Now I am really jealous. Truffles are my absolute favorite food. 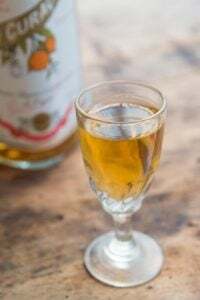 There is a great restaurant in Gubbio, Umbria called “The Tavern of the Wolves” / “Taverna del Lupo” which specializes in cuisine with truffles. My daughter had a truffle lasagna which was unbelievable. Make a trip. 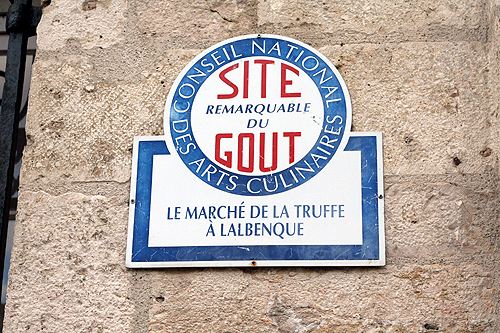 It is absolutely a “must” if you love truffles and good food. Go on a Sunday and partake in their fabulous market..Did I say it was a beautiful village too? As always, I’m glad I waited to read your latest post until after dinner. This one in particular is not one I’d like to read on an empty stomach. Great photos, and I agree: the first pic is timeless. We want a photo of those days, before they were long behind you, when you were still scampering through the woods, etc. etc…. Few animals are as intelligent as pigs and does it show in your wonderful pictures. 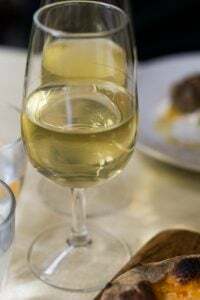 A part de cela I have been treated to shredded WHITE truffle at that Alain Ducasse jewel of a restaurant, the Louis XV in Monte Carlo where all is the epitomy of the earthly paradise of luxe et volupté. I still faint at the memory and not because of the bill. Hi David, I’ve always wondered about truffle hunting. Thanks for this informative post and beautiful photos. But now I’m in love with that pig and may never eat pork again (until I smell bacon cooking, then I’ll change my mind). lanadege: And why they’re so delicious! FBC: They’ve just started introducing US-style credit cards in France (for readers that don’t know, a French carte bleu works like an ATM card and the funds are immediately pulled from your account when you use it) so unfortunately, I’m sure it’s just a matter of time before a few people here find themselves in debt beyond their means, like the folks across the Atlantic. The one thing I like about US credit cards is that you can contest the charges, if necessary, plus you get detailed transaction statements, even online. I always say, if you want to see a French person get enraged, ask them “How do you like your bank?” I tried to get a copy of a check I’d written from my bank here, who refused to give it to me. And when Jérôme Kervie lost nearly €5 billion (around $8 billion) for the bank he was working at, some people here were treating him like a movie star, or hero. But they must have their reasons…maybe if I brought them some truffles, they might be a bit more amenable? What fascinating pics and what an amazing bond the two hunters seem to have. Below are my comments. I am a terrible writer unlike you, so if some of this is of interest to you and you accept to post, merci. 1) Aside from top chefs or people from Provence or Perigord, most français never have fresh truffles : beaucoup trop cher. 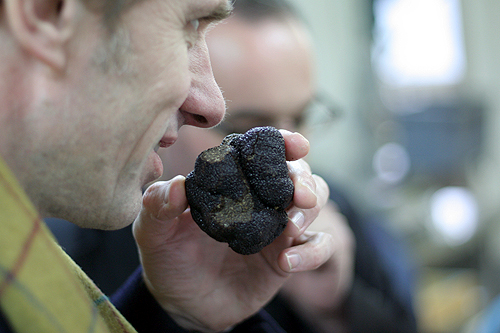 Until recently, I was one of them and had an “attitude” : what’s so great about truffles, other than price and rarity? Like you ? But last november, when my kitchen was rented for a press event and a huge basket of fresh truffles arrived at 10 am and got chopped and minced (some stayed intact, just for the “show”) I had a revelation. The smell (neighbors walking up the staircase were extatic) is addictive, the taste, even when faint, is addictive, bref, truffles are addictive once you are exposed to the real thing. And I am sure you are aware of the strong sexual aspect (if you want more details, we can talk). So now I have totally rehabilited the value of truffles. 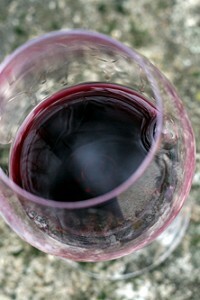 2) There is a centuries old rivalry between Provence and Perigord, each region accusing the other of “stealing”. Personally I cannot judge, so long as they are melanosporum, fine with me, though by geographic inclination, I have a weak spot for the Provence ones. So many americans think they are available fresh all year round, and can be found at the markets ! And often people from everywhere don’t understand the difference between the white Alba truffles (even more expensive) and the french ones. 3) We all hate France Telecom : I can’t wait to have enough “points” to afford an Iphone, it will take another year. And in my building, I have no choice of opérateur : only Orange works here. My new bank CIC, at least my branch, is everything HSBC was not, they treat you like a client, of course they charge you plenty for that, but at least they do grant loans ! As you know, it’s all about establishing a relationship, providing they show good will. When are you available to come visit, for lunch or tea? You know I am here and free most of February. Olivier wants to see you as well, for good reasons. David, I can only echo the applause and adulation. This is one of the best blog posts I’ve read. Pure delight from the photos to the story. Well done. I was already planning to get a pet pig but now I’m even MORE determined. What a cutie-patootie. Paule: Call me crazy, but I’m one of the few people that doesn’t have a problem with France Telecom (although I also have very good experiences with La Poste as well, so perhaps it’s just me.) I’ve learned if you go to the France Telecom/Orange boutique, most of the people are younger folks, who haven’t been jaded by the system…yet. They’re often helpful and friendly. It’s interesting that to French banks, “online banking” means that you can see your statement. And that’s all you can do. However with these new internet banks cropping up, it’ll be interesting to see if a sizable number of French people switch to them. Or if they just stay with their coffre-fort (home safe). Aside from us grousing about banks, tea sounds great. Hope you like chocolate chip cookies! Natasa: I haven’t had all that many truffles, but have smelled and tasted the ones from China and Oregon, and they don’t have nearly the same fragrance. Must get back to Istria to try theirs. but, it appears, instead, it was to head to the market to sell them. I will have to wait for part 2…. I still laugh when I think about the egg yolks trolling around the back of your freezer. What an excellent light hearted post! This sounds like such an interesting day you had. So glad to hear the piggy gets his “cut” in the form of potatoes and apples. Think I would opt for mini pieces of carrot cake! I bet these truffles are superb. 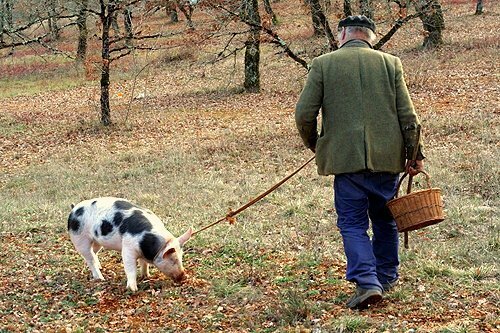 I just heard something about truffles on The Splendid Table (NPR) and they noted that the best truffle hunting spots were jealously guarded secrets – and that you looked a lot less suspicious taking a dog for walk than you did when you took your pig for a walk – thus the popularity of the latter! Great post and such lovely photos. 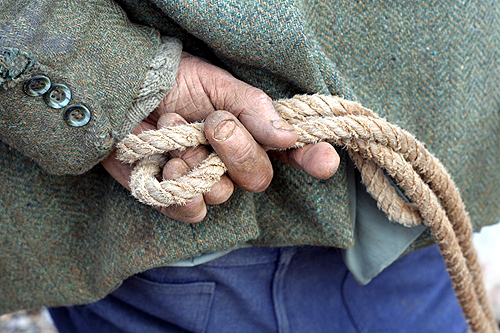 Love this post….your photos are wonderful….especially liked the picture of the man’s hand with the rope….great shot! As a foodie and a pig fan, I am completely smitten with your porcine pics. Thank you for the entertaining article and beautiful photography. 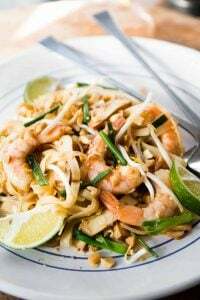 I just finished your book and have become a huge fan of you, and your recipes. Thank you. Amazing story and photos. Thank you for sharing this–it was fascinating. I await with baited breath for part deux! What a wonderful post! I loved this so much I read the whole thing out loud to my husband and we both fell in love with that adorable pig. What fun time that must have been…I cannot wait for part two. Did I understand correctly that you have some friends making a documentary film about this, because I would love to see that as well. Such wonderful photos….thanks for sharing this. PS…I gave your chocolate book to my chocoholic father in law for christmas and it was a huge hit…thanks!! Thanks for the spectacular series of photos. A nice change from the palm trees and tropical flowers I see every day. ” while I wasn’t ready to scamper around the forest with my snout in the dirt on the end of a rope (those days are long behind me)” lol what?? David you´re so funny and should not be read in a quiet place like a college library! David , thanks for your help. I think you’re right, I was in a hurry and probably should have cooked longer. Gerald Durrell, the late naturalist, has written a great short story titled “Esmerelda” about a truffle pig he once encountered in France. Apparently this pig’s owners used to dab her with Joy perfume and the treat for unearthing truffles was ripe Roquefort, not apples or potatoes! I had truffles only once in my life when I was a child. All I remember is that I wasn’t crazy about the taste. I don’t know if it would be any different now that my taste has matured. 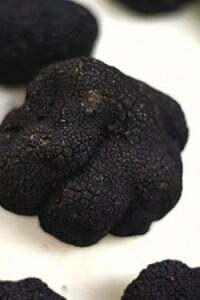 I once watched a documentary somewhere and they talked about the crazy price truffles go for. 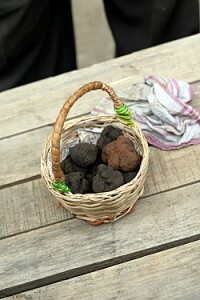 Even more expensive was the price of the special dogs they use to unearth the truffles-it was something like $50,000. Wow!! I was on Amazon and accidentally saw your upcoming cookbook. It looks beautiful. I loved your previous books so I can’t wait to get the new one. This brought back memories of my childhood… thank you for the flashbacks. We had a barn we called our maison de campagne in La Creuse when I was little. Our closest neighbors were a family of farmers: 4 generations living in the same house, tending the same land. Your truffle hunter reminded me of them. This is my favourite hunt. You found some huge ones there. How exciting! David, great post! 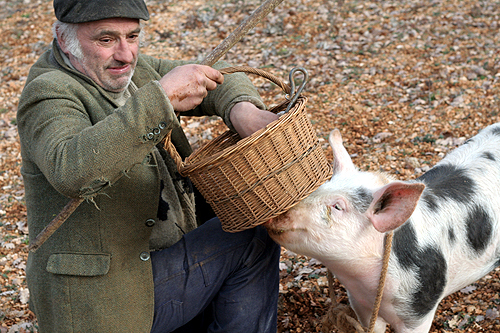 I love pigs (word has it they’re more intelligent than dogs) and your truffle-hunting friend was too, too cute. I do like the pungent flavor of the truffle, but very little goes a long way. What a wonderful story! Thanks for bringing Truffle Hunting to life! Really interesting article and fantastic photos. Eelco: Oops, you’re right. It was his father they named the street after. My map says J. Médecin, so I assumed it was the one that disappeared with all the look. Remerci! I just saw a story on tv where they train dogs to find the truffles. Pig do a better job, but if someone sees you with a pig, they know what you are up to. 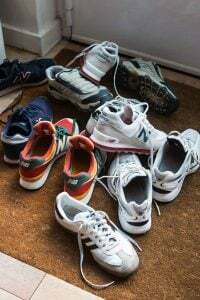 They would not know if you were just walking with a dog. Fab post. I love truffles so much and I can sniff them out pretty well that I’ve been called a truffle pig several times now. I never knew that the pigs actually eat the truffles, now we have more in common than i thought. No need for a leash yet, though! Just wanted to add my praise of the photos to the rest. Very pleasant to look at. I’d like to officially change the saying, “everything’s better with bacon,” to, “everything’s better with truffles.” Who’s with me?! I found myself in Paris during the month of January a couple of years back and was able to do something I’d wished I’d someday do: the truffle tasting menu at Michel Rostang. Wow. It was really awesome. For me the standout was the warm truffle sandwich on country bread with salted butter. 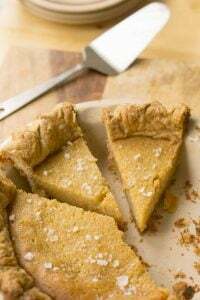 How could something so simple and rustic taste so extravagant and luxurious? I was in Paris again during January this year, David, and had read that you could be bribed into meeting a fan, if that fan would take you out for a nice meal. I was about to write you to invite you for that menu, but then was disappointed when I saw that you would be on the cruise! I have always wanted to do this. I’m Italian -American so Italy was always my first choice. But, you peeked my interest with the French truffle. I have a friend who runs a restaurant here in NYC. Every year he goes to Italy makes a shady, hotel deal with some pizanos and comes how $10k poorer but with one full suitcase of black truffles. Not exactly what I had in mind when thinking about truffle hunting. At any rate, any tips for finding the type of experience you had above when I land in Italy or France? J: There’s a link at the end of the post to a place that offers truffle hunting expeditions in France. I’ve not been on theirs, but it looks like what you’re looking for. Happy hunting! What a wonderful series of photos and articles. Having sourced black truffles on a hazel tree plantation, does anyone know where I would be able to sell farmed black truffles in the UK? I’ve never had truffles before. I bet it’d be fun to wander around with a truffle hunter for a few hours, though. We’re a dog magazine for the Los Angeles dog owner. 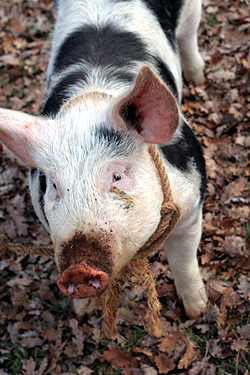 We’re doing a piece on dogs that sniff out truffles but ran into these great pics of the pig. I’d love to use one of these in the article as well. Wanted to see if you may grant us permission to do so and if you might have the pics in hi res as we’re a glossy magazine. Look forward to hearing from you. thanks! Hello David. I’m sure you won’t remember me but we met at a book signing in Rome hosted by Elizabeth Minchilli when you were there for your gelato tour. Anywho, nice to meet you, again. 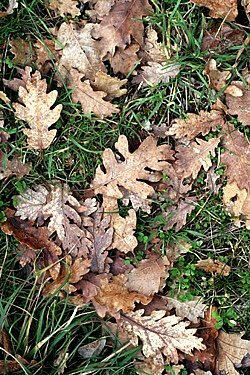 I know this blog post was from a while ago but when I did a google search for ‘truffle hunting’ it came up first, followed by our story on the subject. 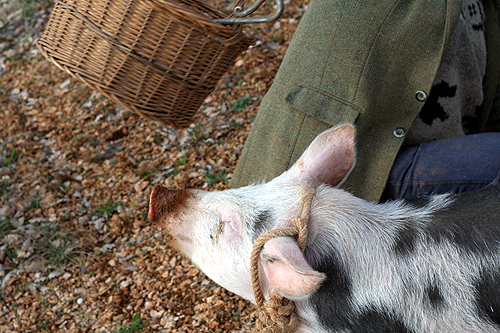 We did a bit of research on why pigs aren’t used widely anymore and we were surprised to learn that the truffle emits a scent that matches that of a male pig – hence they go a little whacko and end up occasionally taking off the fingers of their owners, as you know. Just thought I’d share that little tid bit with you and your loyal readers. The pig in your story is beautiful! I wonder if she was groomed for her film debut? I hate to be so self-promoting but, if anyone is interested in reading our story on truffle hunting in Tuscany with a man and his dog it’s on our site.